If you are looking for a paintball gun and to get into the sport, then read here. This paintball gun article will give you some great advice when you go out and begin looking to purchase your first paintball gun. Paintball Gun pricing can range anywhere from $35 all the way up to $2000+, and that is only for the gun, not all of the other things you need to get after the gun. If you decide you want to spend on the low side and get a gun for $35, dont expect it to last long. The Very inexpensive paintball guns are made out of cheap plastic and well.... you get what you pay for. You can be expecting to replace one of the cheap paintball guns within a month and you will not be too competitive on the paintball field. On the other hand, the $2000+ paintball guns are extremely overpriced for a beginner looking for his or her first paintball gun. I would recommend choosing a paintball gun between the $99 and $250 price range. Depending if you are looking for an all around gun or a woodsball gun, you should consider Tippmann and Kingman/Spyder paintball gun. The other main accessories you will want to have are a CO2 or compressed air tank, Hopper that feeds paintballs into the gun, and a good quality paintball mask. Good luck and happy shopping on all of your paintball gear. The 2012 Proto Rail paintball gun is a must have for any paintball player who wants a great gun at a great price. Now you can get the 2012 Proto Rail for under $300 and it works and shoots just like all of the other high end paintball guns on the market. If perfection is what you want, then consider this gun. Available in a variety of colors and two different styles, you can pick the 2012 Proto Rail paintball gun that fits your style of play and your budget. The Reflex Rail is the high end of the 2012 Proto Rail series guns and boasts a full aluminum constitution with tons of great features. Its little brother has a retail price of $299 and is a great gun for the price. 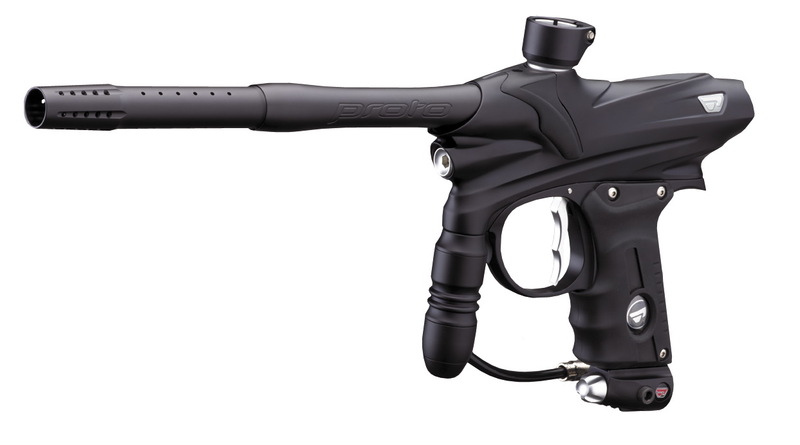 If you are looking at picking up a new gun for the season, then defiantly consider the 2012 Proto Paintball Gun Lineup. The all new Spyder MRX paintball gun is released and on the market for sale today. Packed full of tons of great features, the Spyder MRX paintball gun is a dream come true for any scenario or woodsball player. With the quick twist of the barrel, the Spyder MRx easily transforms from a regular hopper fed paintball gun into a magazine fed marker. The stock magazine of the Spyder MRx has a carrying capacity of almost 20 rounds. Not only does the gun come stock with both mag and loader feeding, the MRx has a M16 style barrel, collapsible stock and carrying handle.